Learning Experience: There is no end. I came across this funny bumper sticker the other day. 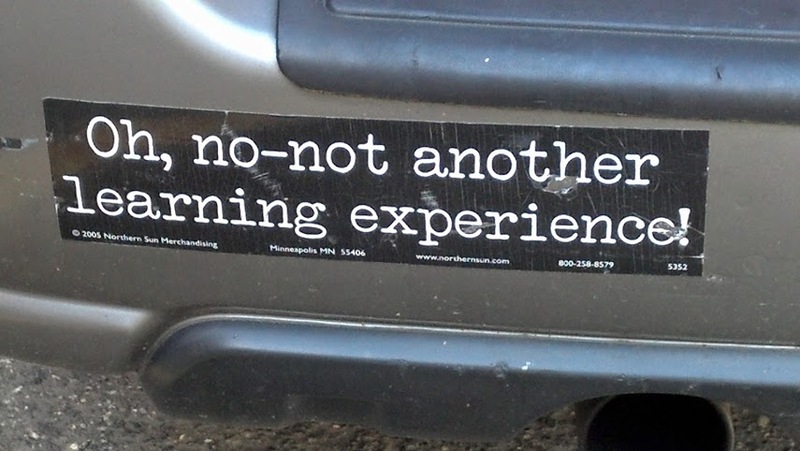 And while I’m quite certain neither the creator nor the car owner had adult learning practice in mind, it is apt. Learning happens, every day, all day, with or without us. When our jobs were mostly process- and product-based—manufacturing, service, design—ongoing professional and personal learning may not have been as important. There was a time when you could practice your job, advance your career and even feel satisfied without contemplating the ways in which learning impacted your development. That time rests in the dustbin of history, at least for those of us who are “information,” “knowledge,” or “learning” workers. How do we guide people to learn what we want/avoid what we don’t want them to learn? How do we facilitate ongoing learning? How do we know if and how learning is applied to jobs and innovation? Where does traditional, formal learning (live training, e-learning, blended, etc.) fit in? The only thing we can say with any certainty is that for most of us, whatever our job is today won’t be our job five years from now. Our career is learning, learning is our career: The better we adapt to that reality the better we’ll be. I say, bring on the learning experiences! ← Learning in a Connected Workplace: But connected to what, exactly?